While at Topsfield we spotted Hugh McMahon, a famous pumpkin artist. We chated with him a bit about how to carve pumpkins. 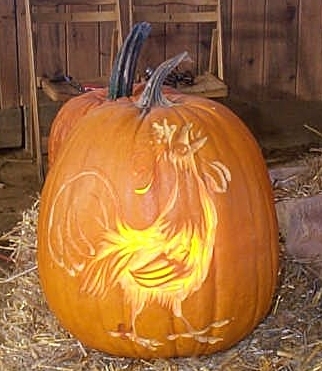 He walked us through the process of planning our project, transfering it to the pumpkin, and finally carving it out. You can see the process he followed by clicking on the thumbnails below. Hugh can be reached via the web page that promotes his work. 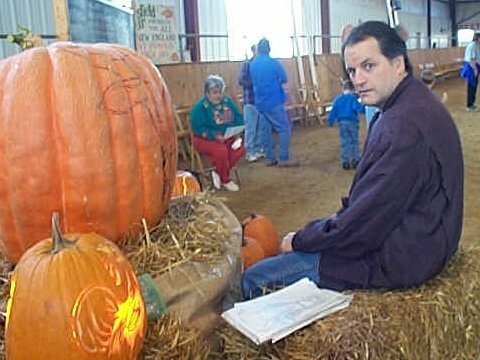 While talking to him, he was interested in obtaining asthetically pleasing Big Pumpkins for his business. As you can imagine, they are not always easy to obtain. If you are interested in selling an Atlantic Giant, get in touch with him next fall.